Three guys ... I visited this restaurant more than 25 times and I always coming back for more. ... Location: road 77…Three guys ... I visited this restaurant more than 25 times and I always coming back for more. ... Location: road 77 Jurdab. 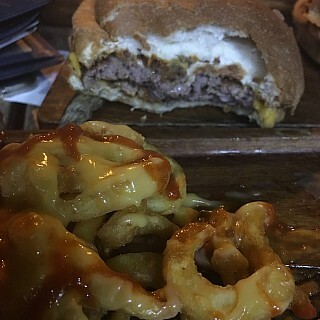 ... Order: Caramelized sandwich with curly fries topped with cheese and water. ... Price: BD 2.600 ... Service: our order came in 14 minutes and it was hot. The stuff are welcoming and smiling. ... Food: the caramelized sandwich is so delicious the patty cooked perfectly to medium well almost last seconds before the well done. The caramelized onions on it are so good and give you some sweetness to match with their amazing sauce. The curled fries served hot and crispy with good amount of cheese. 9/10. ... The restaurant puts a tons of ketchup and mayonnaise on the table along with Sriracha hot chili sauce and mustered. This is show the generosity of the restaurant. ... The restaurant have two sitting areas upstairs and outside. ... 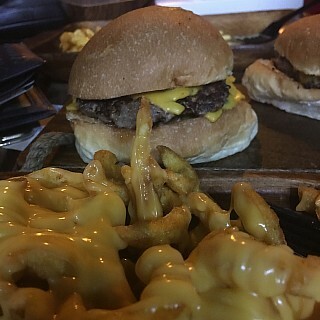 Finally this is the best burger in Bahrain among the Bahraini restaurants at its given price. ... I rate it 9/10.